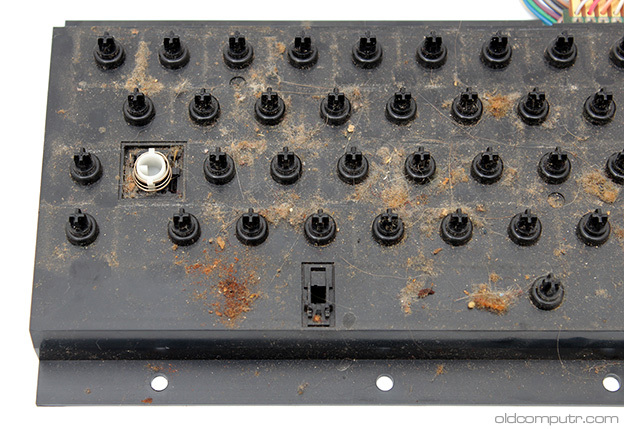 The computers I get often need thorough cleaning, but the keyboard of this Commodore VIC 20 was filthy, especially under the keys and on the motherboard. I completely disassembled the keyboard to wash every component. To remove the printed circuit board it’s necessary to unsolder the two shift lock wires. After patiently cleaning the keys one by one, washing the shell in the bathtub, wiping the pcb with isopropyl alcohol, dusting the springs and the key stems, I decided to compose an isometric (sort of) image of every layer, including the screws. A steady hand and some more patience, but the result is worth the time spent. Looks like new. What an awesome ‘exploded view’ picture of the keyboard ! That will be agreat help when taking my unit apart. I always take pictures as well before disassembly, but they are no match for what you have done. When cleaning and reassembling, just put aside the space bar spring (it’s bigger than the others).